Last time, we gave a pretty example of a chapter break. But what if we want it to look like this? In this picture, the chapter heading (Heading 1) is split on two lines. How is this achieved? Of course, it could simply be a case of two paragraphs (in the technical sense); the first would contain the text ‘Chapter 2’, and the second would contain the text ‘Field Extensions’. That would be very bad, however, because then the semantics of ‘Heading 1’ would imply that there is one (empty!) 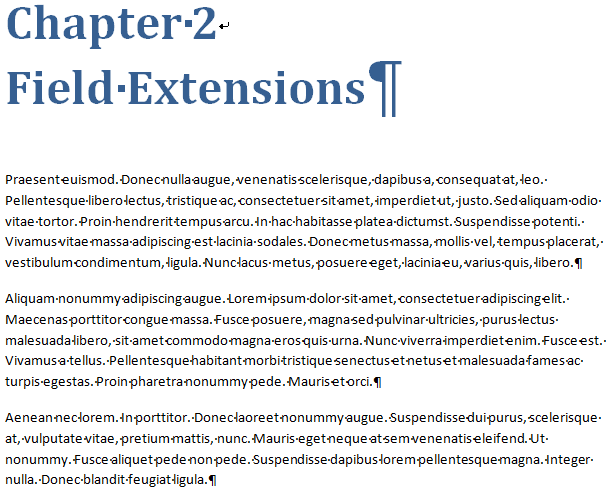 chapter named ‘Chapter 2’, immediately followed by a new chapter named ‘Field Extensions’. That is what would be displayed in the TOC, and that is what screen readers would assume. Clearly we cannot do it like that. Instead, the solution is to insert a soft return using Shift+Return. This will move the caret to the beginning of the next line, but it will not create a new logical paragraph. 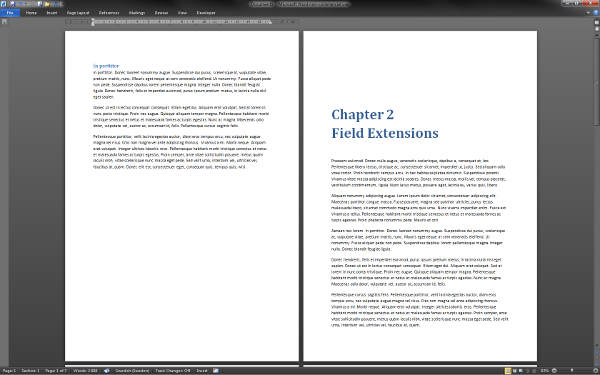 Hence, in the image above, there is only one paragraph with the style ‘Heading 1’, and it contains the text ‘Chapter 2’, followed by a soft return, followed by ‘Field Extensions’. By the way, what is the easiest way to tell a soft return from a true paragraph break? The answer is to turn on the display of formatting symbols by pressing Shift+Ctrl+8. (On US keyboards, an alternative description of the shortcut is Ctrl+*, but on Swedish keyboards the alternative description is Ctrl+(.) You can also press the ¶ button in the Paragraph group on the Home tab in the ribbon. When this feature is turned on, paragraph breaks are indicated by the ¶ symbol while soft returns are indicated by ↲, as illustrated in the following image, where you also see that spaces are indicated by middle dots (•).